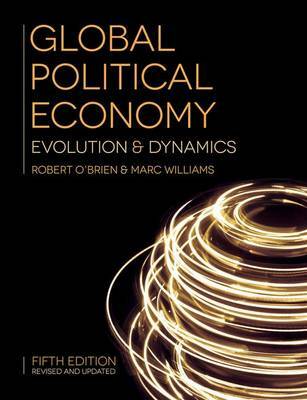 Author(s) O'Brien R.; Williams M.
The landscape of the world economy has been significantly reshaped in recent years. The global economic crisis revealed the fragile foundations of the international financial system, and, in its wake, dynamics of economic power have considerably adjusted. In the fifth edition of this best-selling text, these developments are incorporated into a comprehensive introduction to the global political economy. It takes full account of the emergence of China as a contender to the predominance of the US, of the changing role of the BRICS economies more generally, and of the on-going problems of the European Union, and especially the eurozone.While incorporating the latest developments, Global Political Economy continues to provide a historically-grounded account. It traces the evolution of the global economy, from its roots in the 15th century, through the Industrial Revolution, to the post-1945 world order. It then explores in detail the dynamics of global political economy in the 21st century, providing systematic coverage of the key spheres of activity - trade, production, finance, labour, gender, development, the environment, ideas, security and governance. Lucid, engaging and authoritative, Global Political Economy introduces an unusually wide range of theoretical approaches, moving beyond a traditional three-paradigm perspective to show how these theories can be applied and how useful they are for understanding key issues and developments.